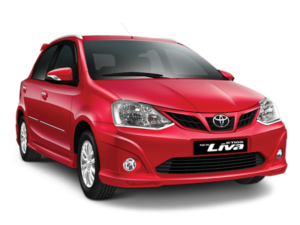 At the front of the Liva, the head lights on the wide front bumper and the chrome lined Toyota emblem give the confidence of Toyota brand. However, the head light size seems on the large size, and though positioned well, it certainly feels that it could have been improved. The positioning of the windshield is in par with aerodynamics and adds to the aesthetics of the front portion. Black radiator grill and fog lamp add to a good impression of the car.